Smart Eye Care Providers Leon Aleksandrovich, M.D. 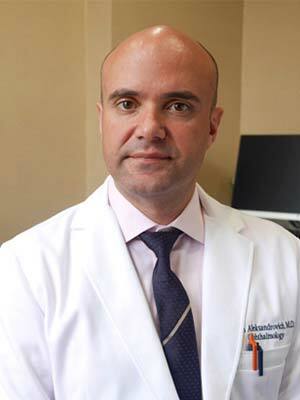 Leon Aleksandrovich, MD, is an optometrist specializing in laser refractive surgery — including LASIK, PRK, Intralase, and iLASIK — at Smart Eye Care in Brooklyn, New York. As part of the Smart Eye Care team, he’s dedicated to using the most advanced technology and laser techniques in his field to correct your eyesight safely and effectively. After graduating from New York University with degrees in Psychology and Russian literature, Dr. Aleksandrovich completed his medical training at Temple University School of Medicine in Philadelphia, Pennsylvania. While there, he was inducted into the Alpha Omega Alpha honors society and received an Outstanding Student achievement award. He completed his ophthalmic surgery training at St. Luke’s-Roosevelt/Columbia Presbyterian Hospitals in New York City, where he was a Chief Resident during his final year. Dr. Aleksandrovich is a respected teaching attending and mentor at St. Luke’s-Roosevelt Hospital, where he trains advanced ophthalmology residents. Dr. Aleksandrovich is a member of select professional societies, such as the American Academy of Ophthalmology and the American Society of Cataract and Refractive Surgery, allowing him to share his knowledge and continually perfect his surgical and clinical acumen. He is fluent in English, Spanish, and Russian, and accepts multiple insurance plans. Book an appointment at Smart Eye Care in Brooklyn for your vision needs.